Easy to grow and prized for its fall foliage, the burning bush makes a nice addition to your garden. This is a guide about growing a burning bush. With its stunning autumn foliage and tolerance for neglect, Burning Bush (Euonymus) makes a wonderful ornamental addition to nearly any yard or garden. Here are some tips for growing and caring for burning bush in your landscape. Beware of the Giant "Dwarf"
Plants labeled 'dwarf" or "compact" are usually assumed to be smaller versions of the same species. It's no wonder then, that many gardeners end up surprised by the irony associated with the name Euonymus alata "Compactus", a.k.a. "Dwarf Burning Bush". Capable of reaching a mature height and spread of 10 feet by 10 feet, the shrub is not exactly "dwarf" in size. Its namesake, "Dwarf", actually refers to the fact that the corky ridges found on its bark are much smaller and less distinctive than they are on the Euonymus species form. Good information to have before planting a row of them under your picture window. Winged Burning Bush is easy to care for and considered essentially maintenance-free, at least until they outgrow their space. It is this ability to thrive in less-than-ideal conditions and subsequent tolerance for abuse (and pollution) that makes them such popular choices for the urban landscape. 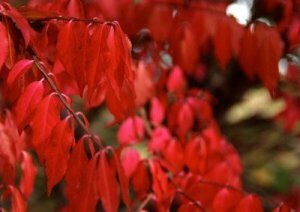 Burning bush prefer to grow in a sunny spot, and in soil that is moist (not wet) and slightly acidic. Fortunately, they also adapt to partial shade, poor soil, dry soil, and the wrong pH, although each of these elements may adversely affect their fall color display. 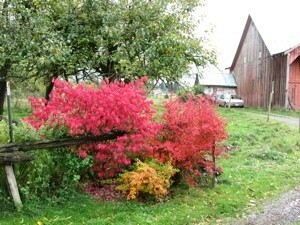 Full sun is needed for burning bush to reach its full color potential. The rapid breakdown of hardwood mulch around the shrubs may result in a nitrogen deficiency (yellow leaves and slow growth). This can be remedied by yearly applications of fertilizer, or by switching to a mulch that decays more slowly. Plants benefit from being fertilized annually in the spring before new growth begins. Have your soil tested first to determine existing nutrient levels before starting a fertilizer regime. Burning bush growing in alkaline soil may develop mild leaf chlorosis (yellowing leaves). Like nitrogen deficiencies, this problem can also be remedied through a yearly application of the right type of fertilizer. Prolonged stress like an extended summer drought may cause your burning bush to turn color prematurely. Burning bush is generally trouble-free, but watch out for scale and powdery mildew. The answer as to whether or not you should prune your burning bush depends entirely on your individual situation. Healthy growth does not depend on regular pruning, so in most cases, your shrubs will look best if left alone. However, when you need to control their size and shape (and eventually you will), pruning will become necessary. Thinning (when convenient): Use pruning shears to remove up to 1/3 of the old or dying branches. This will keep growth manageable - at least for a few years. An alternative is to slowly encourage a more upright, tree-like form by removing all of the lower branches over time. Shearing (early spring): Use a hedge clippers to shape multiple bushes growing together into a traditional hedge. Make sure to trim the top slightly narrower than the bottom to allow light to penetrate to all of the branches. Rejuvenating (early spring): To encourage all new growth, prune the bush back severely, to within 6 to 12 inches from the ground. Although this type of pruning is extreme, the plant will recover nicely over a period of years (providing its in good health). 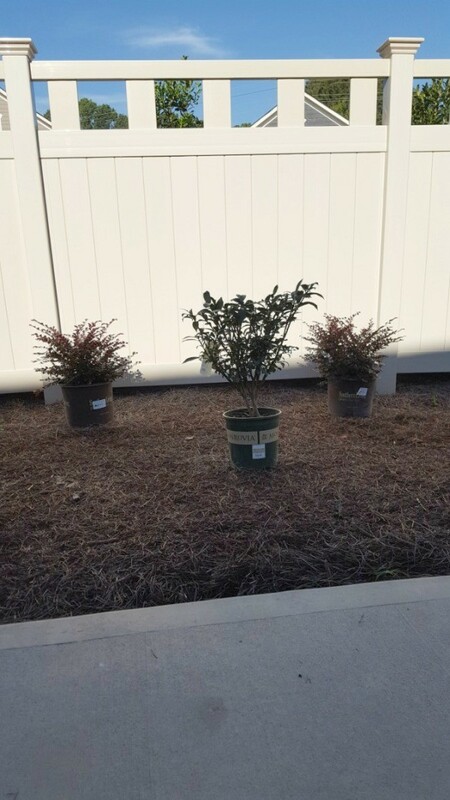 Transplanting: When pruning is no longer a viable option, you might want to consider transplanting the bush to a larger space, or replacing it altogether with something more size appropriate. Soil: Not super fussy, but does need ample drainage. Form: Shrub-like; starts with an upright growth habit becoming more rounded with age. Foliage/bark: 1 to 3-inch long narrow leaves, finely serrated; medium to dark green in summer and turning flaming red (full sun) to pale pink (shade) in the fall. The bark has visible corky ridges on the regular-sized species, but is smaller and less distinctive on the so-named "dwarf" variety. Flower/fruit: Inconspicuous flowers in late spring/early summer; produces tiny red-orange fruits in the fall that are attractive to wildlife. Height/spread: Will slowly grow to 8 to 10 feet tall with a spread as wide ("Compactus"); other varieties may be much taller. Euonymus alatus 'Rudy Haag' is shorter - typically reaching 5 feet tall and 5 feet wide. Hardiness: Most varieties are hardy to zone 4. Winged burning bush is native to northeastern Asia and was first introduced in North America as an ornamental plant in the 1860s. Although still considered a popular landscaping shrub, it is considered invasive in certain parts of the United States - especially in some Northeast states and New England. Winged burning bush can invade a variety of disturbed habitats including forest edges, fields, and roadways. Once established, it can form a dense stand that chokes out native vegetation. Before planting burning bush, check the Invasive Plant Atlas of the United States to see if it is considered a threat in your area. My burning bush has small, completely black bugs, that have not moved yet. I found them on end of new growth, under leaves, and on the stem, in clusters. They are making the leaves roll and turn towards the inside. I have never seen this before. I have not introduced anything new in 3 years. I'm having the same problem. They look like aphids, only black. Lady bugs seem to be eating them, but there's not enough lady bugs to really make a difference. I've been making a spray of 2 Tbsp. dish soap, 2 tbs veg oil in a spray bottle of water. Then blast them with it. On alternate days I just knock them off the plant with the force of the water from the hose. Seems to be helping, but I notice the ends of the plants are dying where they were. And I had just gotten these plants looking good after a couple winter's ago when the rabbits completely girdled them. Do u dilute this formula with the spray bottle attached on your hose? I planted a burning bush plant. While planting it all hair roots were torn off. 6 months later it is not dead, but looks exactly as we planted it. It has not grown at all. Should we wait or replace it? Thank you. Do you have it getting the proper amount of sun/shade/water? Try giving it some fertilizer. Take a picture of it and go to your local garden center. I have done this several times and they have been very helpful. I don't know my gardening zone, but I want to know if a burning bush will grow where I live? Sometimes it is very windy. Also where can I buy the plant? Thank you. Here is a link to determine your gardening zone. I am not certain if you can grow one in Mexico or not but you can ask at a nursery or find out on one of the nurseries online. Just google nurseries and I am sure you can find out. I live in Wisconsin, and my bush only turns red in the fall, right before it goes dormant. I was wondering if you can get a start off a burning bush, plant it, and it will grow? This fall I took a scraggly looking branch off a little burning bush I had. The botanical name is Euonymous alata. These bushes are green during most of the growing season but turn fiery red in the fall before they lose their leaves. It is for this reason that people plant them. Yesterday I checked the cutting's progress. I wasn't really expecting anything so the resistance I felt when I tugged gently at the cutting was surprising. I very pleased when I extracted the cutting and several tiny little roots were revealed. You can see the little roots on the right side of the picture. Starting the cutting was pretty simple. I found a nice looking section of stem about 5 inches long. I cut it below a node, dipped it in water and applied powdered rooting hormone. When you dip the cutting in water it allows the powder to stick better. Then I put it in a container with sand and made sure to keep the sand moist. I will leave the cutting in the sand for a couple more weeks then pot it up. I'm keeping it in the garage to avoid frost damage on the tender little guy. Good luck. I'm not sure about the rooting of the burning bush, but a lot of folks don't know that the burning bush drops seeds readily each year and a good friend might be more than willing to give you all the starts you need. I don't mulch under my bushes, so that may be helpful to know. They drop seeds under the mother plant and they come up everywhere like crazy. What kind of food should I use on my Burning Bush? I spread some mulch under my buring bushes a few years ago. Other than that I leave mine alone. Right now they are a brillant red. They don't require a lot of care. An organic mulch is really all they need because the mulch will break down over the years and improve the soil. If they were doing poorly this year, an inch of compost around them will help feed them without stressing them. Question: When Should Burning Bush Shrubs Leaf Out in Spring? I received some bare root burning bush hedge plants, about 25 of them. I planted them in the fall last year, in October. When I first received them from gardendirect.com and planted them they started showing leaves and signs of growth after just a couple weeks. Then as winter came they lost all the leaves and the stems went from green to red. Now it is near the end of March and they are not showing any signs of growth however if I scratch the stem it is still showing green under the bark. Am I just being impatient or should they be out of dormancy by now? I live in northern California. They leaf out later than many other bushes. Let nature take its course. I have a small courtyard that gets tons of sun. I'm planning on planting a dwarf burning bush that I plan to diligently maintain in small tree form (5-6' H 4-5' W). Is there a chance the root system could damage an adjacent concrete patio as the bush gets older? Even if I maintain the size, is there any chance it can outgrow the space? Thanks! Can I trim a burning bush after the leaves fall and before winter sets in? We live in New York state. This page has some information about pruning. Generally, I believe early spring and later winter are good times to do heavy pruning. Light trimming can be done just about any time. What is the proper time to prune a burning bush? I have several burning bushes and I prune them whenever I think of it, Any time I have my pruners in my hands maybe pruning something else. They have always done fine. I don't think you could kill them if you tried. I just noticed that the rabbits did quite a number on all my burning bushes this winter. They have pruned them down quite a bit. Will this affect their growth this summer? Or doesn't it matter? If the trimming was mainly on the ends of branches towards middle, bush will probably be fuller. If they took off whole branches in uneven manner, hard to say. Pruning often encourages growth. Q: I have a bug problem and no idea what they are. I have a Burning Bush, now 3 years old. I found what looks like black aphid looking bugs. They are very sticky and the black ants are all over where they are. The growth that they are on looks wilted. I have cut off all the bad parts but they come back. I am looking for a natural way to rid of them because the bush is near our garlic. Does anyone know what these are, the cause of them, how to rid of them? It sounds like you have a classic case of aphids. The sticky substance you're referring to is called honeydew and is secreted by the feeding aphids. Ants just love to feed on honeydew, hence the sudden explosion of ants around your bushes. Some species of ants will actually "farm" aphids-caring for them and protecting them so that the ants have access to a constant supply of honeydew. Give the leaves a good forceful spray (within reason) with the garden hose. This will knock off most of the aphids. To get rid of the remaining pests, mix 1 finely chopped onion, 1 large clove of finely chopped garlic, and 1 tablespoon of liquid dish soap with 2 cups of water. Put this all in a blender on high and then strain out the solids using cheesecloth or the toe of an old pantyhose. Pour this into a hand-held sprayer and spray this all over your burning bush. Store any leftovers in the refrigerator for several weeks and keep using it at the first sign of trouble. Keep your eye on them--once the ants discover them, they may well take care of the problem! If not, mix up some mildly soapy water and spray that on the bushes, it should take care of them! (Luckily they're easy to get rid of!) Watch, though, that they don't invade other plants, or get on your roses. How can you start a new bush from the one you have? Is it too late to plant a burning bush? My sister says the leaves on her burning bush are looking like you can almost see thru them. I want to help her with them, but am not sure where to start or what exactly to do. I sprayed my yard with bug spray and since then all the leaves have fallen off of my burning bushes and they look dead. It is August and I don't know what to do to make them produce more leaves. Should I go ahead and prune them to three inches or wait until early spring? We live in Tennessee and the temps are crazy this time of year so I don't know what to do. Can anyone help? My burning bushes have been healthy for 15 years, but 4 years ago they started developing light green spots on the new growth. By mid summer the leaves start turning brown around the edges and dying. They start the spring full, green, and healthy looking and then become diseased. No one knows what is wrong with them. Can you help? We recently planted a dwarf burning bush. It is in full sun, in sandy, well drained soil and I water it daily. Some of the leaves are brittle and brown. Am I watering too much? I live in Texas, when is the best time to plant a dwarf burning bush? This past fall the burning bush did well. It took a year or two to get so pretty. The first year I was disappointed, but the wait was worth it. My Burning Bush shrub has turned red and the bush is dying. The four other Burning Bushes are fine. What could have happen? My Burning Bush leaves are droopy, the soil is moist.